The notion that a particular sporting location is the “home” of a sport, athlete, or sporting practice has been explored recently in sport heritage research. It has also come under scrutiny as the “birthplace” moniker can provide a sporting place a significant amount of cultural and economic capital. Indeed, to be the true and recognized “home” of a sport conveys authenticity, and suggests a level of reverence that other similar sporting places simply do not have. In some cases, “home” is contested – and that there are many different places that could be considered “home”. In others, such as Lord’s Cricket Ground in London, there is little debate. Lord’s is the home of cricket. Lord’s self-proclaimed “home of cricket” title is well-earned. It is probably the most recognized and revered cricketing ground in the world, has the largest cricket archive in the world and (I believe) most notable cricket museum in the world, and it is the place where the laws (or rules) of cricket were formed and continue to be honed. While there are many other famous, or beautiful, or historic cricket grounds around the globe, few are as revered as Lord’s. I find it difficult to assess Lord’s, and the 90 minute behind-the-scenes tour I took there, in any sort of objective manner. Simply put, I love Lord’s. It was the place I learned about first when I was began following cricket. I, in fact, knew about it before I knew anything about the sport. It is the place I often long to go during a summer day, and it is the place of one of my fondest sporting experiences. One of my favourite pieces of cricketing journalism took place at Lord’s, while another article from last year beautifully chronicles a serendipitously-spend day at the Home of Cricket. To me, there are few places I’d rather spend a summer’s day (or five, if it’s a test match) than Lord’s. 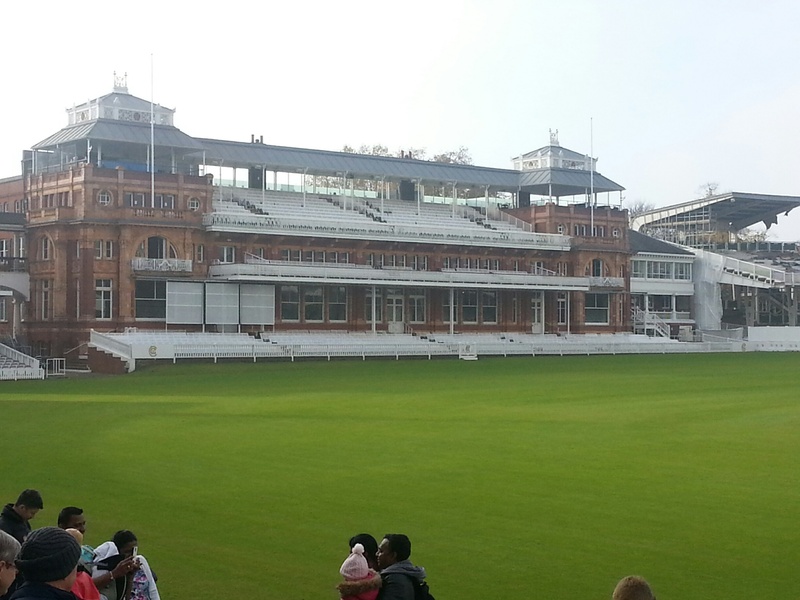 I have been to Lord’s on a few occasions, but this was the first time I toured it with some knowledge about cricket. Our tour group, about 25 in all, was truly global. I was the lone visitor from North America, while the rest were from Sri Lanka, India, Australia, New Zealand, Pakistan, and other parts of England. Though the site itself is, ostensibly, primary ground for English cricket, touring the pavilion (above) re-enforced how important the site is to global cricket. Paintings and memorabilia from famous cricketers from around the world decorate the walls and corridors. Gasps of delight could be heard from various segments of the tour group when they saw paintings of their cricket heroes, or when they saw the names of their country’s cricketers on the Lord’s honours boards. In terms of the tour itself, it was one of the more exceptional tours in terms of access, probably owing in large part to the fact it took place in early November during the off-season. 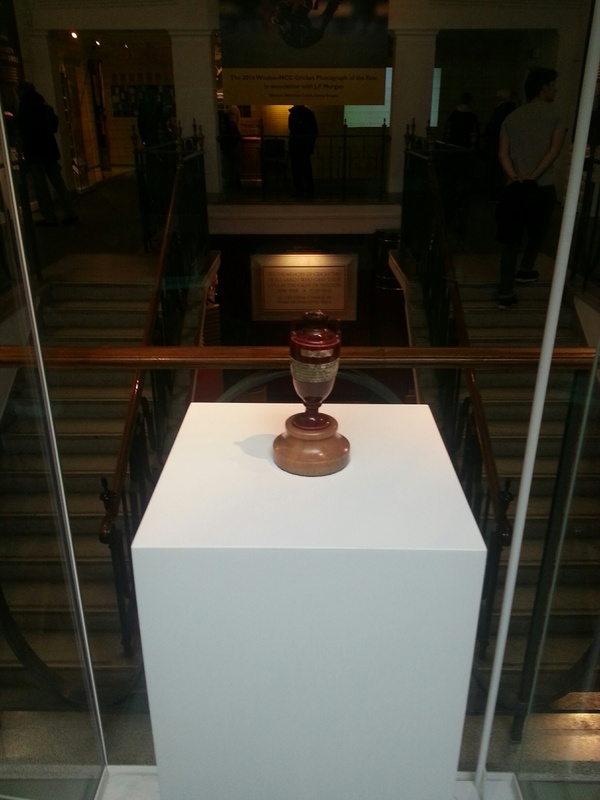 The tour began in the museum, where the guide discussed the ground as well as some of the most famous artefacts at the museum – not the least of which was the Ashes urn awarded to the winner of the England – Australia test series (England are the current holder of the Ashes, having defeated Australia in the summer of 2015). 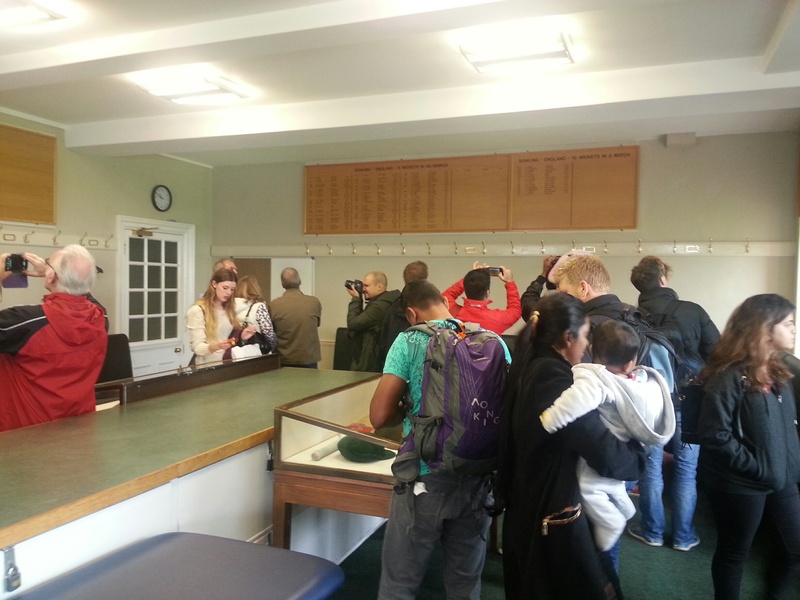 The tour then went through the famous pavilion, including the Long Room where members of the very exclusive Marylebone Cricket Club watch matches, and both the England and visitors changing rooms. The tour then stops at a statue of W.G. Grace, arguably the most famous cricketer of all time, before proceeding to the Tavern Stand for birds-eye views of the Ground. Normally, the tour visits the media centre (as is common with many sports venue tours) though, on this occasion, the media centre was undergoing renovations and was not available. So, to finish, the tour visited the side of the pitch for a ground-level view, then (as expected) concluded at the shop. It is difficult for me to critically assess the tour and location, in part because of my great affection for the place, but a couple of things stood out. The first was that virtually everyone staff member I encountered at Lord’s, from the guide to the security personnel to the ticket sellers to the people at the shop, were unfailingly polite and willing to help and answer questions. I wonder, of course, if this is because they are seen (and see themselves) as ambassadors of the Ground and of the sport. I think I was expecting something slightly more snobbish, perhaps – that visitors were something they had to endure rather than something that, in my view, they seemed to welcome. In any event, everyone I encountered seemed genuinely proud of Lord’s. Secondly, I have NEVER seen tour patrons treat a location with such reverence. 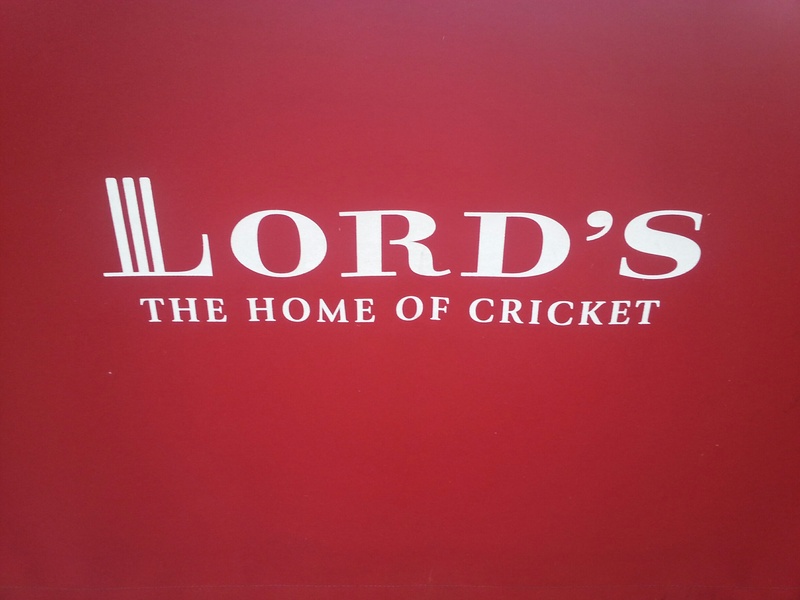 For many on the tour, Lord’s is sacred ground, and some of the conversations overheard during the tour suggested that visiting Lord’s was the main reason for taking the journey to London. Finally, there was never an overt sales push during the tour – which is relatively rare for behind-the-scenes tours. Few mentions of buying match tickets, or purchasing merchandise, or renting parts of the ground for special events, were mentioned on the tour. Even the large-scale renovations of Lord’s were mentioned only in passing, and prompted by a visitor’s question. For those interested in cricket, touring Lord’s is a must. Even for those with a limited interest in cricket, or none at all, the tour is also quite inclusive and doesn’t always assume that visitors know particular players and matches. 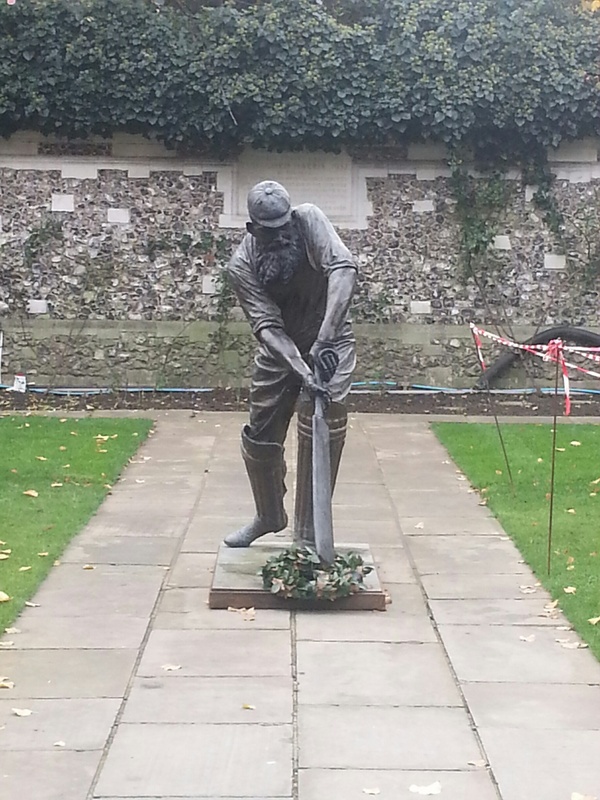 In many ways, touring Lord’s is to see a glimpse of two centuries of modern sport development. It is a place steeped in history (though, of course, the tour doesn’t shy away from the business aspects of Lord’s, nor the fact that aspects such as gambling were central to its historical development) while still very much being a contemporary sports venue. It is reverential without being overtly hagiographical. It is distinctly English while still being international. It is a remarkable place. By Gregory Ramshaw in Uncategorized on November 23, 2015 .